"Under Pennsylvania law, can an insured tortfeasor assign his or her bad faith claim against an insurer, under 42 Pa.C.S. § 8371, to an injured third party?" By way of background, Judge John E. Jones, III of the U.S. Federal Court of the Middle District Court of Pennsylvania previously ruled in this case, at 877 F.Supp.2d 228 (M.D.Pa. 2012), that both the insured's bad faith claims and Unfair Trade Practices and Consumer Protection Law (UTPCPL) claims were indeed assignable. In the underlying third party case, an Allstate insured defendant who was allegedly driving under the influence at the time of the accident, incurred compensatory and punitive damages as a result of a jury verdict. After that trial, the insured defendant assigned his alleged rights to sue the carrier for bad faith and violation of the UTPCPL to the plaintiff to pursue. The federal trial court denied the carrier's motion to dismiss the claims presented and the case went up to the Third Circuit which has now tossed the issue over to the Pennsylvania Supreme Court for an analysis and decision. 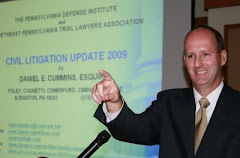 Anyone wishing to review the Pennsylvania Supreme Court's simple Order in this regard may contact me at dancummins@comcast.net. I send thanks to Attorney Suzanne Tighe of the Wilkes-Barre, PA office of Thomas, Thomas & Hafer for bringing this matter to my attention.